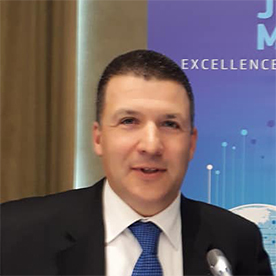 Jean F. Crombois (Phd Contemporary European History, Free University of Brussels, 1999 and Postgraduate Diploma in Political Science, 1993, University of Essex) is Associate Professor of EU Politics at the American University in Bulgaria since 2005. Previous positions: Wiener-Anspach Post-Doctoral Fellow at Balliol College (University of Oxford) from 1999 to 2002, Assistant Professor (Alakhawayn University, Morocco) from 2004 to 2005; visiting professor at the Jagiellonian University of Krakow,, Free University of Brussels and New Bulgarian University; visiting Fellow at the Oxford Center for European History (Spring 2010). Main areas of research include the EU’s Eastern Partnership, Interest Groups and European Integration as well as History and Theory of European Integration. His last book: Camille Gutt and Postwar Finance (Routledge, 2016). Contributions on current affairs published in The Contemporary Review (Oxford), Revue des Deux Mondes (Paris) and various Belgian newspapers and news magazines.